Keeping the trees surrounding your residential or commercial space in the best shape and condition not only ensures the beauty of your property, but also ensures the wellbeing of your trees. If you are looking for a reliable company for pruning large trees or trimming tall trees, we can help. 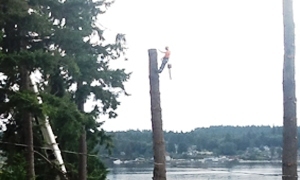 We at Hunter’s Tree Service offer high quality tree climbing services for the Spanaway, WA community. Our climbers have the required tree climbing training and the proper tree climbing gear, which enables them to provide the required services quickly and safely. You can rely on them for the proper pruning and trimming of trees. Whether you are pruning large trees or trimming them, you should do it properly to ensure not just the health of the trees, but the safety of the surrounding areas and people. 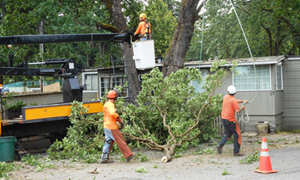 The purpose pruning large limbs is to ensure that they do not fall on nearby structures, damaging them or hurting anyone inside. You can rely on our experts for efficient and proper pruning and trimming. 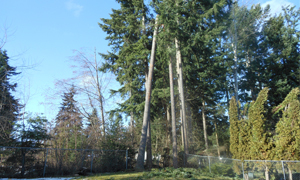 Why Choose Us for Trimming Tall Trees in Spanaway? With the plethora of companies offering services for trimming tall trees in Spanaway, choosing the best one can be a challenging task. However, you need to choose a reliable and professional company for trimming tall trees as this is a job that requires expertise. We are the ideal company for trimming tall trees as we possess all these qualities and know how to trim tall tree limbs safely and quickly. If you have any requirements of tree climbing services in Spanaway, call Hunter’s Tree Service at 253-777-1938.